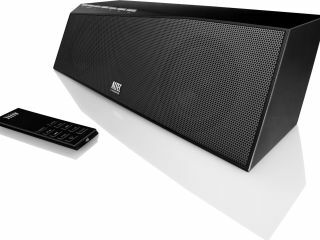 Altec Lansing launches its new InMotion Air wireless speaker this week, with the company claiming that the music system can work at a distance of up to 100 metres from a Bluetooth source, with no compromise on fidelity. The inMotion Air iMW725 is the next gen of home audio, according to its maker, for "Universal Audio Freedom with No Compromise" (yes, all caps, according to the press release scribe). Altec Lansing's InMotion Air also allows up to seven hours of listening between charges, so it is ideal for parties and holiday listening on the beach or by the pool. Providing you don't get it wet or play Vanilla Ice on re-run. If you need a decent portable speaker to blast out your iPod's AAC's then you can also pick this new model up in slate black or gunmetal grey. It would seem that military themed colours are this seasons new black. It will set you back £180 and will work with a laptop, iPhone, iPad or any other Bluetooth-enabled device. "Users want access to their music at all times, whether it's from their computer libraries, their mobile phones or portable players. The inMotion Air delivers freedom from the confines of wires so that the benefits of rich, crystal clear sound can be shared anywhere," says Adrian Bedggood, EMEA Director of Business Management. "Our heritage as an audio innovator enabled us to engineer a new wireless audio experience with an immersive soundstage, so whether consumers are connecting across the house from their computer or across the room from their iPhone, their music is always in reach." The unit also ships with a remote control and full support for iTunes and Windows Media Center. The apt-X sound codec technology has been integrated into the inMotion Air to offer CD quality audio, regardless of file compression encoding. "Additionally, Waves' Maxx audio algorithms are used to further enhance the performance for the best possible audio experience never before heard from a wireless portable audio device in this price range." True audiophiles will no doubt question such claims, although we will wait until we get a final unit in for review to make the call on that.